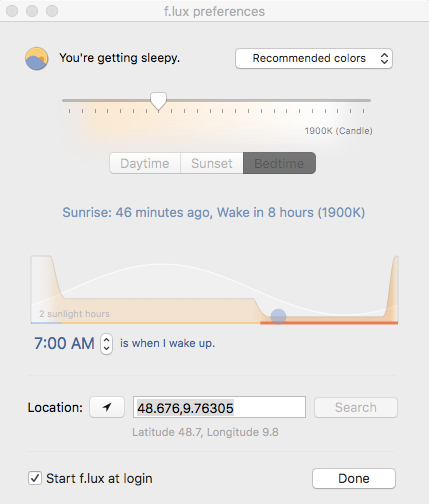 Hey Flux - I'm traveling but I have my mac internal time set to my hometown time (not the time of the area I'm in). I thought the "location" search in flux would accurately set flux to detect my current location time (not my hometown time) but it looks a little buggy. You can see in the screenshot below that it says sunrise was 46 minutes ago but I'm supposed to wake in 8 hours. It'd be nice if I set the flux location that it give me the option to override the time zone data. Potentially you've set the "local time" instead of the timezone? It's best to adjust your timezone only but leave the clock setting alone when you travel. https://justgetflux.com/timesync.html is our tool to see if your clock is set right.